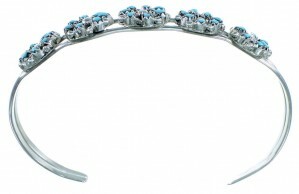 The inner bracelet circumference measures approximately 5-1/4", plus a 1-1/4" opening, and 3/8" at widest point. 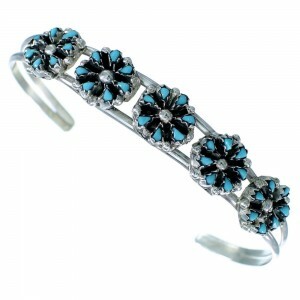 This is a very gorgeous bracelet that would make a great gift! This piece of Native American jewelry is Zuni, hand crafted out of genuine sterling silver and real Turquoise stones. A total of THIRTY FIVE needlepoint stones are delicately placed in hand cut bezel settings, while mini silver beads add style for a lovely finish. 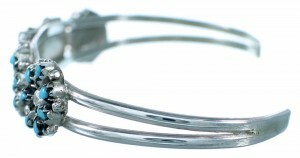 TWO silver bars make up the cuff and complete the bracelet to perfection!